Editor's note: This is repost of an article original published on the Generation SAS blog, of which Julie Petlick is a regular contributor. SAS is hosting a group of AP Statistics high school teachers from across the US who have come together to focus on moving the AP Stat course beyond one in which the calculator is the primary tool. These educators are spending five days at SAS world headquarters discussing how the course is currently taught, the relevance of integrating software into the course, and how this type of skill will impact student outcomes. Chris Olsen, author of Teaching Elementary Statistics with JMP, is leading the workshop, which gives teachers hands-on experience using JMP Student Edition to explore the AP Statistics course content. As part of the workshop, teachers are collaborating to develop exercises they can implement during the upcoming school year. The goal is to give their students experience using JMP Student Edition to explore and analyze their data. The workshop has also featured John Sall and Herbert Kirk of SAS and Roger Woodard of NC State University as speakers. The presentations have centered on the importance and relevance of statistics in today’s economy and ways teachers can stimulate student interest and analytical skills in their programs. Curt Hinrichs of JMP was also on hand to collaborate with the teachers and shared, “AP Stats is a rapidly growing market in statistical education and it’s vitally important students learn with modern tools. 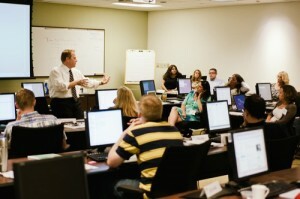 JMP is committed to supporting teachers who want to adopt a more modern approach. We are looking forward to more workshops of this nature”. Find out more about JMP Student Edition by reading a previous blog post by Curt Hinrichs, or by visiting the JMP Student Edition product information page.